Alright, let’s get the research out of the way. I know it’s annoying how I research everything after I eat it. And I’m also aware it’s a risky strategy. But the approach is two-fold. 1. I think it’s interesting and 2. I’ve already eaten it so if I liked it, who cares what’s in it? Banh Mi Cha Cua – Blue crab cake “po boy” sandwich with lettuce, tomato and onion. Banh Mi Ga Nuong – Grilled chicken sandwich with carrots, fresh pickle, cilantro and sliced jalapenos. 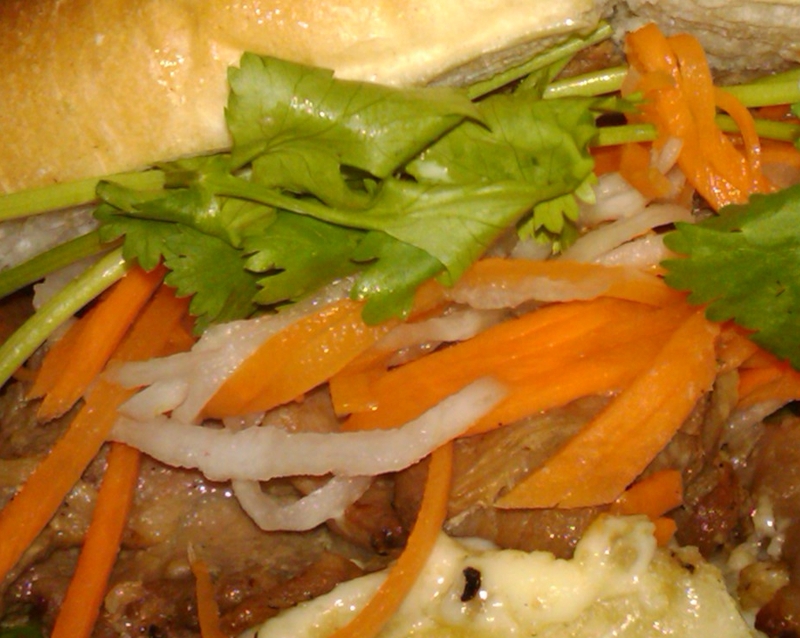 Banh Mi Thit Nuong – Grilled pork with carrots, fresh pickle, cilantro and sliced jalapenos. Alright, back to Pho Hot Bistro. My point is I thought I wanted pork but wanted to make sure it was the best idea. 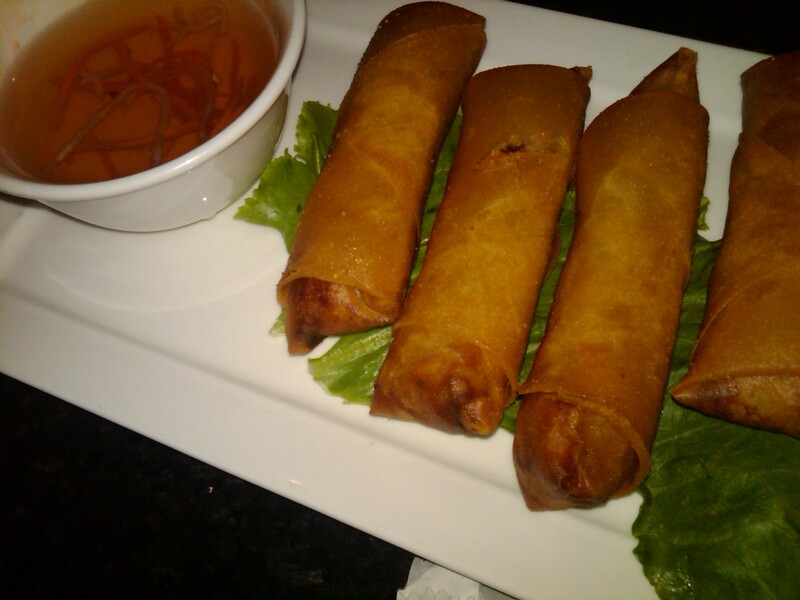 So I asked the waitress, as she brought out my Vietnamese egg rolls! Yes, I did sneak that in there! I knew I wanted an appetizer. Mostly because I was starving. But also because, let’s face it, a review’s more interesting with more than one dish. Mmmmm… These were also recommended by the waitress. The egg rolls were DELICIOUS! And more than enough for two people as an appetizer. And very reasonably priced at under $4. Boom! My waitress suggested the pork banh mi. 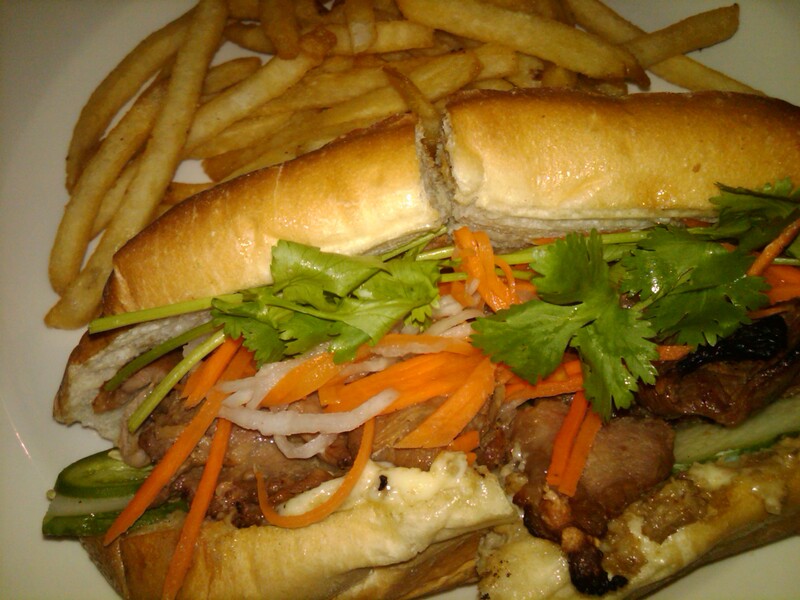 Or, as the menu likes to call it banh mi thit nuong. A little google searching makes me think thit nuong means grilled, marinated pork. But who knows? The stars, universe and Vietnamese sandwiches are aligning. I’m in for the win! When my sandwich arrives, I’m almost two egg rolls deep. And happy as a…. As a jalapeno slice in a pho restaurant? I assume jalapenos are happy to get thrown into everything. I know they make me happy. Anyway, my sandwich, with a side of fries looks simply delicious! This sandwich was so good. and the fries hit the spot. It had something creamy on it. OK, that sounds kind of gross. My point is I’m not sure if it was cheese (my guess) or mayo (as I’ve seen online is included), or something entirely different. All I know is that for less than $4, it was the best deal I’ve come across in a long time. And by deal I don’t just mean cheap. I mean cheap and delicious. Because if it’s not wonderful, then it’s not a good deal. The bread was awesome. Kind of crusty on the outside, but soft in the middle. Then the warm, marinated meat, mixing with the salty of the pickled stuff, plus the spice of jalapenos and cool of the cilantro? PERFECTO. Or, however you say perfect in Vietnamese. Word on the Internet is “hoàn hảo.” Sorry if that’s offensive to anyone. I have no frame of reference. Oh, and the fries were good dipped in the egg roll dipping sauce. Alright, so where was I? Oh yes, enjoying delicious. Next time I go back (I want it to be soon), I plan to have pho. And I’d definitely get the egg rolls again. But, I felt like the fried egg rolls with the french fries was a little too much fried. So next time I’d either only get the sandwich (most reasonable course of action, since it’s more than enough food), or get the sandwich with a non-fried appetizer. And save the fried egg rolls to pair with pho. Someone please go with me soon to eat pho on the patio! Perfect fall weather and perfect fall food!